Idiopathic scrotal calcinosis (ISC) consists of multiple asymptomatic nodules of the scrotal skin. The nodules begin to appear in childhood or in early adult life, increase in size and number, and sometimes break down to discharge their chalky contents. Numerous theories have been proposed to explain the pathogenesis of this condition, but the principal debate revolves around whether it is a dystrophic calcification of the structures, like an epidermal cyst, or the calcified nodules are purely idiopathic. We present nine cases of this rare pathology treated surgically. Nine cases of idiopathic scrotal calcinosis were diagnosed in the Department of Pathology, M. R. Medical College, Gulbarga, over a five-year period, from 2009 to 2013. The clinical and pathological findings are summarized in [Table 1]. The patients' age ranged from 26 to 65 years (Mean 42 years). A majority of the patients presented with scrotal swelling (8/9) [Figure 1] and were clinically diagnosed with sebaceous cysts (7/9). Cases 1 and 5 gave a history of white chalky discharge from the swelling and Case 5 presented with a non-healing ulcer over the scrotum as well. The other associated features seen in the two cases were: One was with right-sided inguinal hernia and the other with a left-sided hematocele, with ultrasound confirmation. There was no history of connective tissue disease or trauma and the patients' serum calcium and phosphorus were within normal limits. 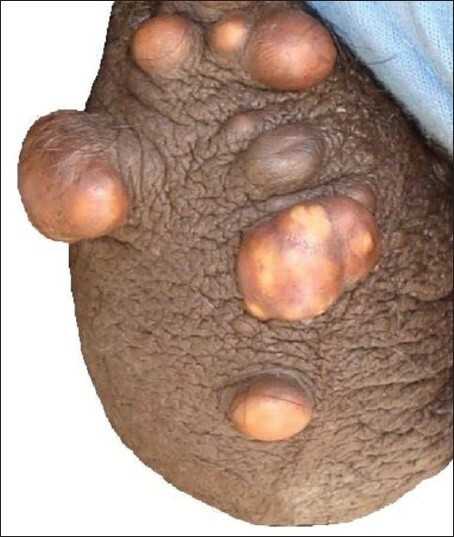 Of the nine cases, five were composed of a single nodule ranging from 0.5 to 3 cm in size (Mean 1.89 cm) [Figure 2]. The remaining four cases presented with multiple nodular swellings. 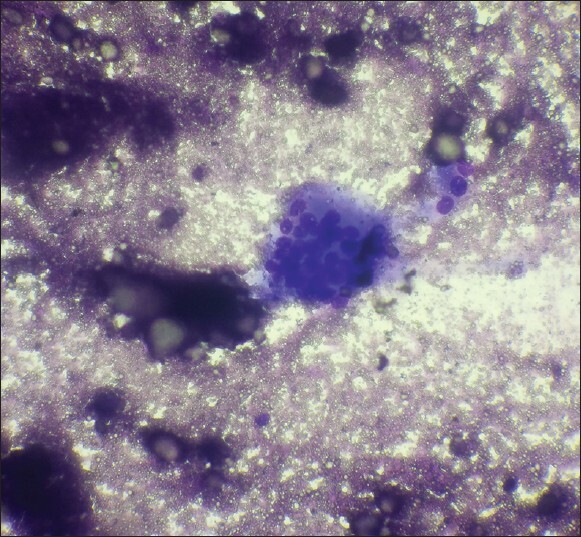 Fine needle aspiration cytology (FNAC) was performed for Case 1, which revealed amorphous granular calcified material and calcium crystals with occasional macrophages and multinucleate foreign body-type giant cells [Figure 3]. Hematoxylin and eosin stain (H and E) sections revealed amorphous basophilic masses seen in the dermis associated with a prominent foreign body giant-cell reaction. The scattered inflammatory infiltrate comprising of lymphocytes and eosinophils were also noted [Figure 4] and [Figure 5]. 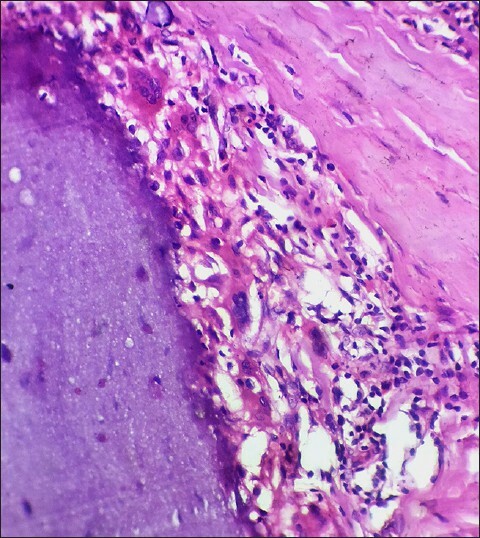 One case also showed an epithelial cyst along with the calcified masses. All cases underwent surgical excision and no recurrence was observed in the follow up. 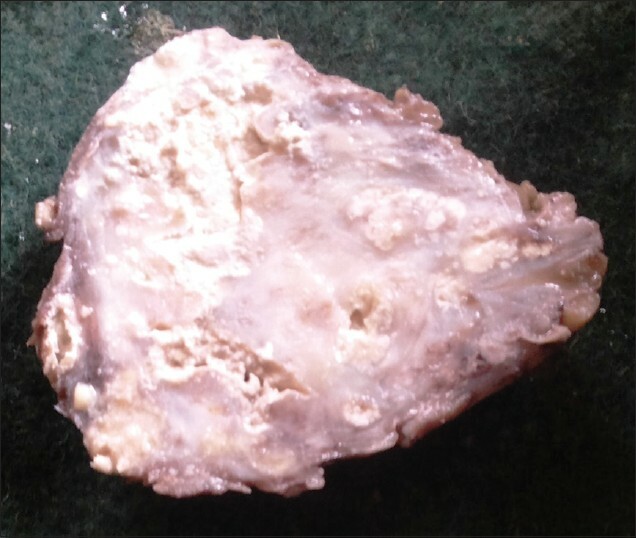 The exact pathogenesis is yet unknown and the theories of origin include idiopathic calcification occurring within the normal scrotal collagen, dystrophic calcification of the inflamed scrotal epidermoid cysts, eccrine duct milia or dartos muscle, and calcification secondary to minor trauma of the scrotum. One of the largest studies describing this entity is by Dubey et al. It is a study of 100 cases, which support the theory of dystrophic calcification of the epithelial cysts. One case in this case series shows the presence of an epithelial inclusion cyst, which favors the same theory. The largest international case series is of 14 cases, by Shapiro et al., which suggests an idiopathic origin for this condition, similar to most of the cases in this series. The nodules vary in number and can be solitary or multiple. Dombale et al. have described 220 nodules in a single case. These lesions are usually asymptomatic. Rare occurrences of itching and chalky white discharge have been reported. Most of the cases in this series have presented with scrotal swelling. Two of the nine cases have also had a history of white chalky discharge from the lesions. Clinically, scrotal calcinosis may be confused with an epidermal inclusion cyst, steatocystoma, cutaneous horn (actinic keratosis) or other benign tumors, such as, lipoma, fibroma, angiokeratoma, and lymphangioma circumscriptum. A definitive diagnosis is based on the histology, confirmed by the presence of Von Kossa positive dermal deposits,  which have also been noted in all the cases of the series. In this series, a majority of the cases have been clinically diagnosed as sebaceous cysts. The two cases with coexisting right-sided inguinal hernia and left-sided hematocele, respectively, were incidental findings. The ancillary tests performed include, ultrasound of the scrotum of two cases and FNAC in one case. Ultrasound in idiopathic scrotal calcinosis (ISC) showed soft tissue calcification. It was missed in both cases, where only the prominent findings of hernia and hematocele were detected. Very few case reports were available in literature with regard to the cytological features of ISC. Dombale, et al.,  described the experience of performing fine needle aspiration of the scrotal nodule as difficult, with a gritty sensation and aspiration of the granular material. The presence of amorphous granular and refractile material surrounded by lymphocytes, histiocytes, and foreign body giant cells, in the absence of epithelial cells, to rule out calcified epidermal cyst on FNAC smears favored ISC. , The FNAC of Case 1 clearly revealed calcified material with macrophages and foreign body giant cells, which was only suggestive and not diagnostic of ISC. A definitive diagnosis required histological confirmation. The treatment for idiopathic scrotal calcinosis was conservative surgical excision. , All cases in the present series underwent surgical excision. In addition Case 2 underwent right herniorrhaphy and Case 5 left orchidectomy, for a hematocele. The patients were followed up for six months and showed no recurrence. Idiopathic scrotal calcinosis is a benign condition characterized by calcified nodules within the scrotal dermis. It is usually asymptomatic and often misdiagnosed as a sebaceous cyst. Pathogenesis is still debatable, with a majority favoring dystrophic calcification of the epithelial inclusion cysts, which is supported by one case in this series. Surgical excision is the treatment of choice and has an excellent prognosis. This case series attempts to create an awareness of this rare pathology, which is often missed out on routine investigations and misdiagnosed. Maize JC, Maize JC Jr., Metcalf J. Metabolic diseases of the skin. In: Elder DE, Elenitsas R, Johnson BL, Murphy GF, Xu X, editors. 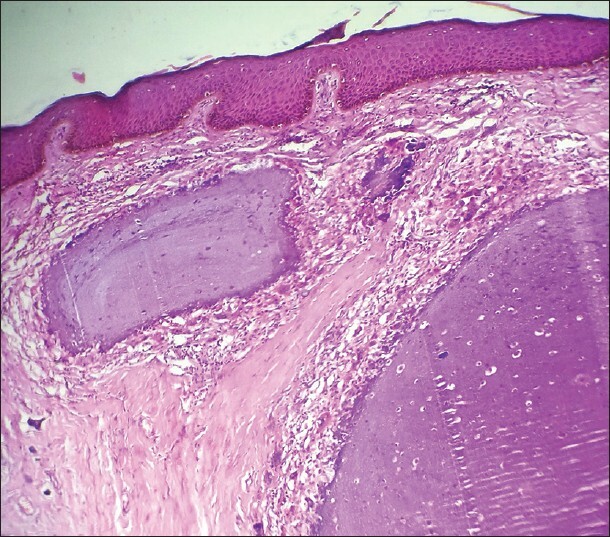 Lever's Histopathology of the Skin. 10 th ed. Philadelphia: Lippincott Williams and Wilkins; 2009. p. 425-58. Fernandez-Flores A. Calcinosis cutis: Critical review. Acta Dermatovenerol Croat 2011;19:43-50. Dombale VD, Basarkod SI, Kotabagi HB, Farheen U. Extensive idiopathic scrotal calcinosis: A case report. J Clin Diagn Res 2012;6(Suppl 1):478-9. Dubey S, Sharma R, Maheshwari V. Scrotal calcinosis: Idiopathic or dystrophic? Dermatol Online J 2010;16:5. Shapiro L, Platt N, Torres-Rodríguez VM. Idiopathic calcinosis of the scrotum. Arch Dermatol 1970;102:199-204. Bushby LH, Miller FN, Rosairo S, Clarke JL, Sidhu PS. Scrotal calcification: Ultrasound appearances, distribution and aetiology. Br J Radiol 2002;75:283-8. Khan MA, Maheshwari V, Rahman K, Sherwani RK, Varshney BK. Idiopathic calcinosis of scrotum: Cytological diagnosis of a case. J Cytol 2008;25:23-4. Shivkumar VB, Gangane N, Kishore S, Sharma S. Cytologic features of idiopathic scrotal calcinosis. Acta Cytol 2003;47:110-1.